NOTE: Our bi-monthly working group meeting for Tuesday May 17th has been RELOCATED to the Van Zandt Community Hall, 7-9. Please extend the invitation to neighbors across communities and counties. 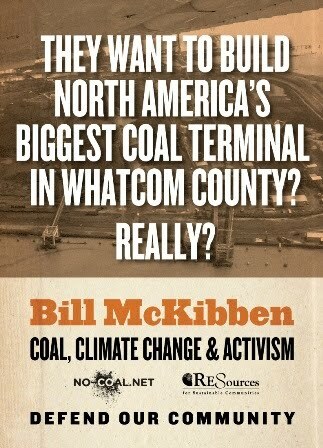 You have probably learned that BNSF execs have been all over town announcing that the coal trains in route to the proposed GP coal export terminal will go through Bellingham and will not go through the South Fork Valley. While this announcement may seem logical to those familiar with the environmental and structural realities of the route, it is bittersweet. Oh…and talk is cheap and dangerous. The fact is that there is no shortage of coal to be shipped. If the GP Terminal is built and afterwards BNSF decides to add the Highway 9 route, it is just an internal routing decision rather than a permitted action. It is up to us to continue making our case to be included in the Environmental Impact Statement [EIS] for the proposed GP coal terminal. This announcement should not pacify us to stop taking actions to shape the public policies and decisions that will affect our businesses, land, air, water, and quality of life. The Highway 9 route is, as always, an alternative route. Each time the Shoreline tracks are shut down [because of mudslides] or overloaded [because of increased rail traffic], trains reroute to the Highway 9 route. Presumably, this will happen more and more frequently when coal trains extending 1.5 miles long become frequent to our region. SafeGuard the South Fork is taking the stance that ‘announcements’ of this or that by BNSF, SSA, or anyone else should not dissuade collective citizen power and strength by residents in Whatcom and Skagit County concerned about Big Coal turning our communities into a transportation corridor for their Asian markets. Thank you to everyone who came out to the Acme Elementary School tonight. It was great to hear the wisdom of the community alongside two informative speakers. Bob Ferris of RESources discussed the scope of the environmental and social impacts of the proposed coal shipping terminal at Cherry Point. While his discussion certainly included information on the potential train impacts in the South Fork and upon Bellingham, we also learned about the additional environmental and social concerns related to the large-scale project that ranged from understanding the mining source at the Powder River Basin, to identifying the ecological impacts on wetlands at Cherry Point, as well as articulating the larger global concerns regarding the true cost of coal export to China. Jeff Margolis drew on his expertise developed through his service on the Bicycle Pedestrian Advisory Commitee. Jeff took a realist look at the proposed costs the county would be required to absorb in order to ensure safe public rail crossings that could handle the increased train traffic to Cherry Point. At present these crossings, by the way, range from gates and lights to nothing. Considering the leap in train traffic that would come with the Cherry Point coal export plan, the number of overpasses necessary to ensure public safety would offset much of the tax benefits forecasted in favor of the proposal. Jeff closed with a song and a recommendation for us to keep a 100-year mind, because from an intergenerational perspective 100 years is not long, particularly for families that have already been in the South Fork for longer than this amount of time. Another highlight from tonight is that we took a step towards addressing the issue for ourselves. We showed up, shared, learned, and [in]formed opinions. Thank you! The conversation was passionate and forward thinking. With this, there is quite a bit of work to be done in the next couple of weeks to define avenues for voicing concerns. We hope to continue conversations with other organizations working on this issue and to update you here about events, action items, and other opportunities to remain involved. We will also be getting an email list and Facebook page up and running soon. Thank you to those who offered their assistance to work on the many action items that were expressed at the meeting tonight. If you are interested in spending some time on these needs/requests, please let us know at: info@safeguardthesouthfork.org. Oh…and keep your ears open for a regional National Public Radio [NPR] story tomorrow on tonight’s forum and SafeGuard the South Fork. We each hold a piece and a story, so thank you for sharing! A community discussion of the possibility for round the clock, mile-and-a-half-long, open load coal trains to travel through the South Fork in route to the proposed Gateway Coal Terminal at Cherry Point. Coal trains have a history of degrading human health, water, and agricultural & forestry lands, making communities along the “inland route” through Burlington, Sedro Woolley, Acme, Van Zandt, Deming, and points north and west out to the coast particularly vulnerable. Nicole Brown, on behalf of Safeguard the South Fork, will facilitate a community dialogue and present action items.